My choices today are mostly dark and deep except for Pathfinder, which is about 1.5 seconds above us at the speed of light. I don’t want to visit the Moon. All that dust would make me sneeze. Nor do I need to visit any other planetary or lunar bodies in our solar system. I’ll wait for an advanced civilisation to invite me to visit their world where they destroyed AutoTune as soon as it was invented. My selections today are a typically mixed bag from the trans-genre Mammal. They include los bagpipes from the Argentine Highlands, for example. Och aye, amigos. Yet again metal shows it’s universal and multinational. This is a good day for nothing more energetic than listening to music. The combination of temperature and humidity here in Zululand gives us a humiture, or heat index, of an effective 41 degrees C. That’s on the boundary between “Dangerous” and “Extremely Dangerous” for outdoor activity that requires any exertion. The Zulu kids on the lawn in front of my office are playing football. I’ll stay here with cool music. Borknagar’s folk black metal pops up again today, but I think this is the first appearance of Gojira’s thrash death in my selections. I could try to remember but that won’t work. I don’t even remember… now what was it I don’t remember? Damn. I could check on my year-by-year lists but that would mean switching on the computer. I’m not feeling very energetic today. 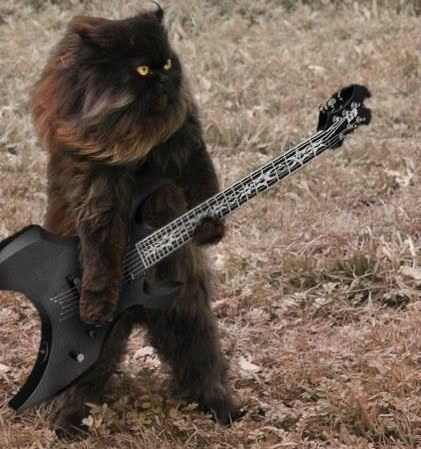 Dark Metal Cat says I should do as he does and sleep 20 hours a day. Bornagar, Therion and more Dimmu Borgir in today’s selection. Black Metal Cat says all the Norse music is starting to make him feel like a Viking. I told him he wouldn’t be a very good one. He doesn’t have a beard, just very long sideburns. A while ago, at the same time as Matt and Reggie, I posted my Top 100 All Time Favourite (Metal) Albums over at the forum The History of Metal on FB. It took a good amount of time and effort to put it together, but it was so much fun! My taste in metal is always changing, so the list will not always look the same. In fact, it’s already a bit different than it was when I first put it together and posted it on the forum almost a year ago. I was sad to see Anette Olzon leave Nightwish, she was the reason I started to really like this band and their music. Anette and Marco (bass player/vocals) really complement each other so well. The folk music influences makes this album more interesting than their previous ones and it doesn’t have a single bad song on it. Fortunately I had the chance to see them live with Anette after this album was just released and it was a really great show.